Jump inside for all our hard-researched Moneyball tips designed to help you win big DFS bucks! Don’t forget to pump the Match Committee podcast for Round 19 while you craft those winning sides. For a couple of reasons, it’s wise to look past Jake Stringer ($5,900 FWD) this week. Firstly, he’s coming off a soft tissue injury and common sense suggests he might not be returning in prime condition. That’s obvious. Less intuitive is what Geelong has been doing to opposition forwards this year – they are miles in front as the most restrictive when it comes to what opposition FWDs are able to rack up against them. In fact, I’d be overlooking most WBD players who live in the Forward 50 this week – last time these two sides locked horns (in Round 13 this year), not one Bulldog kicked multiple goals. Corey Enright ($7,900 DEF) has been going old school lately, thumping out scores of 131 and 101 in the past fortnight, including 18 marks in that span. Now I normally wouldn’t talk him up due to a lack of upside (only 1 score above 110 MB all year), but the scaled tip in his favour when you consider that he comes up against a Bulldogs side that’s ranked #2 in conceding points to opposition DEFs. If you’re a fan of anecdotal evidence, Enright scored 101 against them just half a dozen weeks ago as he took advantage of the structural chink in the Bulldogs’ armour. 26 touches, 5 marks, 5 tackles for 101 MB on debut for Sam Menegola ($3,500 MID) – as a late inclusion, no less! He attains gold-plated ‘Lock’ status this week because, based on his VFL form, this first-up effort is no fluke. In fact, Menegola’s last 3 scores from full games in the VFL: 145, 116 and a massive 165! Sticking with the rookies here, and we have Pups Josh Dunkley ($5,200 MID) and Clay Smith ($4,800 MID) on offer again this week. Once again, both performed admirably for their price-tags last weekend and look like threatening 80-plus each week in their current form. 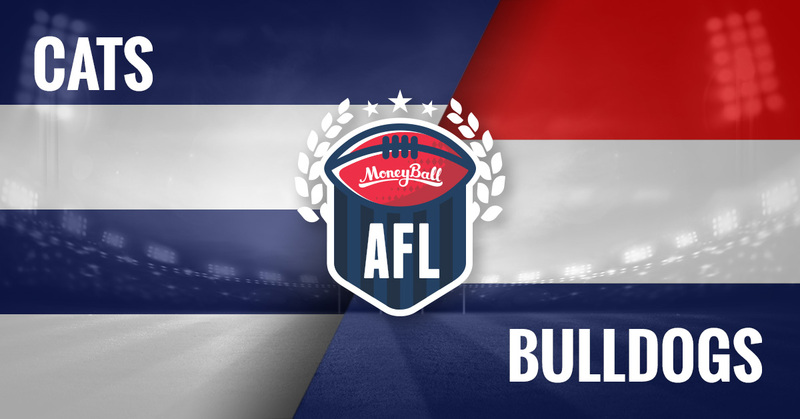 However, we’ve already established that Menegola’s a lock – so can you afford to take in all 3 rookie-priced MIDs and risk losing out on firepower with some of the bigger name onballers? I’d suggest not, and for future reference, I’m a Clay man if you find yourself having to choose between the pair. The rest worked wonders for Jimmy Bartel ($7,900 MID), scoring 115 MB after coughing up scores of 48, 63 before his visit from The General. He’s now safe to pick as usual in his 300th, shaping up as a steal at under $8k. Matt Priddis ($8,600 MID) put West Coast on his back last week, winning 17 of his 24 possessions in a contest and adding 15 tackles for 141 MB, but the stats stack up against him in Round 19. While I preach form over history, his last two scores of 82 and 84 against Collingwood is slightly concerning. However, most damning is that he routinely finishes the year off weakly. Over the past four seasons, Priddis has averaged 7 points less from Rounds 19-23 compared to Rounds 1-18. Heath Shaw ($8,100 DEF) might’ve posted 110 AFL fantasy points against the Blues but finished with just 97 Moneyballers due to a round-high 10 clangers – which was also a personal career-high! I don’t love his form, don’t love his susceptibility to a tag and don’t love his price. I’m really not Shaw. Let’s get some perspective here before we get to the proposal; these are the Moneyball scores against Goldstein in the past 4 weeks: Sam Jacobs 99, Scott Lycett 93, Jackson Trengove 91,Brodie Grundy 80. Surprising, right? Given how fearful we usually are of Goldy’s dominance? So Tom Hickey ($6,800 RU) will face this unusually generous beast this week, and actually has strong form of his own with most recent scores of 106, 98 and 110. It’s a pretty obvious call here for mine; save $2k on an out-of-sorts Goldstein and snap up Hickey while he’s on fire. Devon Smith ($6,900 FWD) was, quite simply, a massive disappointment over the early part of the season, yet hits Round 19 with a bit of momentum. In fact, Devon has pumped out scores of 113, 94 in the past fortnight and begun showing signs that his electric 2015 season was no fluke. He’s racked up at least 23 touches and 2 goals in both those games and, thanks to his horrid output earlier this year, you can pick him up for under $7k. I think Smith’s a risk worth taking this week, don’t you? Let’s kick this off with an easy one; Brendon Whitecross ($3,500 MID) spent a lot of time on a wing, finishing with 95 MB points. If you don’t have him in your side at base price, you won’t win. Brisbane’s lack of key DEF personnel continues to be a fantasy goldmine! In Round 7 earlier this year, Westhoff kicked 3 sausage rolls while Dixon bagged 5 as they capitalised on the Lion cubs back there. Obviously, Dixon is out injured and as a result, Justin Westhoff ($7,400 RU) will spearhead the Power this week earns must-pick status, while Wingard/Young are good value with the extra crumbs on offer. Bryce Gibbs ($8,800 MID) has been sneaky good this year, but did you know that if the season were to finish now, his 107.2 AFL Fantasy average would be his best over his career? Seems to be a forgotten fantasy player… Which means you can capitalise on his under-appreciation from the fantasy public! Gibbs loves playing Hawthorn (last four scores are 112, 109, 123, 112) and he hasn’t dropped below 100 in MB over the past five weeks. Sold. He’s an absolute beast when allowed to run free, but Lachie Neale’s ($9,100 MID) numbers drop dramatically when the opposition attempts a tag. More specifically, his last 3 games battling against the tag reads 55, 83 and 71. On the other hand, his last 3 games without a tag: 131, 133 and 110. For $9.1k, those are some scary stats. Will Sunday be a rare opportunity to run free for David Zaharakis ($6,900 MID)? The Crows haven’t tagged in the last 11 weeks and surely they’ll back themselves to dispose of the Bombers, right? Thanks to averaging just 68 MB in his past 6 games (compared to 105 beforehand), Zaharakis is cheap as chips and he’d make an excellent POD for you if it paid off. Meanwhile, Xavier Richards ($3,500 DEF) impressed in a spearhead role for the Swans last week, kicking 2.1 on his way to 81MB. At base price and with a favourable match-up, he’s a logical pick if you’re looking past the obvious Lance Franklin ($8,200 FWD). I’ve been looking closely at the Suns to see who steps up in this injury crisis, and here’s what I’ve come up with: Alex Sexton ($5,300 FWD) moved up from a HFF last week into a full-time midfield role and earned himself a perfect 10 coaches votes as a result. In fantasy, it was his first ton in 51 career games (116 MB), yet it feels like he can threaten three-digits with the right role. Touk Miller ($6,700 MID) has also stepped up as a midfielder, averaging 110 MB in the past few weeks. It’s all about the big men this Sunday. Essendon’s giving up most points to rucks over past 5? Easy. Pick the guy whose averaged 109 over his past 7 games – against much harder opponents along the way. Sam Jacobs ($8,700 RU) will be huge and his recent scores of 114 and 114 against the Bombers is just a nice statistical bonus. Meanwhile, while Sydney swap out their pinch-hitters with Sinclair out and Nankervis in to cover that F/R rol, Sam Naismith ($3,900 RU) has grown more comfortable each week in the starting role. This climaxed with a 90-point score against the Blues last week, oozing value at his junior price. Naismith is one of the first picked for me in the Freo vs Swans contests.